The UW Flexible Option is a self-paced, online, competency-based education program through which you can earn a bachelor’s degree or certificates from a University of Wisconsin institution. As a student in a UW Flexible Option program, your progress is based on your ability to show that you have mastered the content – not based on how much time you spend in class. You may have gained that knowledge through prior coursework, military training, on-the-job training, or from within our program. By emphasizing what you know rather than how much time you spend learning, this flexible format lets you advance toward a UW degree or certificate at a pace you control. What is Competency-Based Education and how is it different from traditional higher education? Competency-based education (CBE) is an academic format which assesses you on your level of mastery in specific content areas, rather than by time you spend in class. Once you demonstrate mastery of the curriculum on your own timeline, you receive credit – whether it takes you 3 weeks or 3 months. 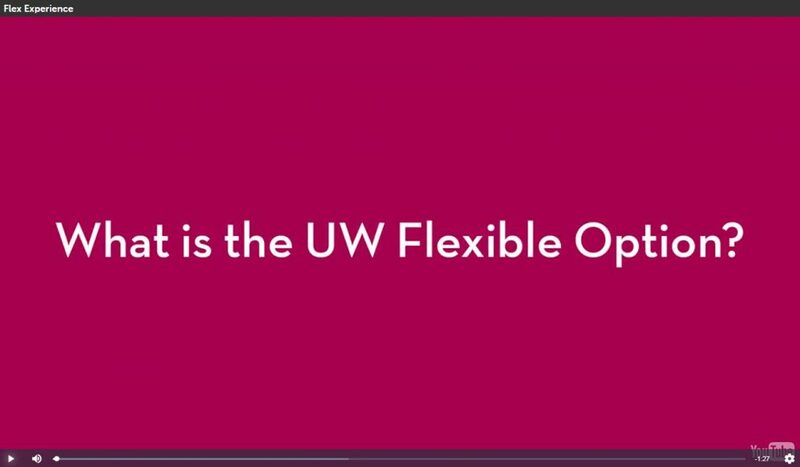 Flexibility – Programs in the UW Flexible Option are self-paced, which means there are no live log-on requirements or set test dates. You choose when you complete your coursework and where – whether it be at home, the coffee shop, or the breakroom. Independence – The UW Flexible Option’s structure is focused on you. You demonstrate mastery of the skills you’ve mastered on your own schedule, without having to worry about how fast or slow other students are progressing. Affordability- With a fixed rate tuition model you can control the costs of your degree. Check out the program page of the degree or certificate you’re interested to learn more about what financial assistance may be available. Personalized Support – While you’ll be in control of your education, you won’t have to go it alone. You’ll have access to highly qualified Academic Support Coaches who will be there to guide you through your program, help you set priorities to meet your goals, and provide encouragement along the way. Call an enrollment adviser to find out more about the UW Flexible Option and get started today! Will I receive a real degree or certificate? Yes! The degree or certificate you receive will come from a UW institution you know and trust. You will leave your program with a genuine UW-Milwaukee, UW-Parkside, or UW-Madison Division of Continuing Studies credential. Is Competency-Based Education (CBE) legitimate? Are programs offered in the UW Flexible Option format accredited? Do employers value degrees and certificates earned through the UW Flexible Option? Yes! Each program is designed by UW System faculty members, the same faculty who teach traditional courses, with input by industry experts. That means you’ll master skills you will actually need in your field. How will I interact with my professors? Compared to traditional programs, faculty interaction in UW Flexible Option is likely different than you may be used to. Since our programs are fully self-paced and you’re moving through the program on your own time and schedule, there are no live lectures or faculty-led sessions that tie you to a specific class time. But, you’ll still have contact with the instructors in your program: this might be through regular check-ins you have with the instructors, feedback received on assessments you’ve submitted, or simply reaching out to an instructor for guidance on academic questions. In addition, you’ll have access to your Academic Success Coach who will be there to help guide you to resources that will help you achieve your goals. UW Flexible Option programs are self-paced. That means there is no specified length of time required by each program. Based on your unique needs, transferable credit, schedule, or life experience, you may finish your program as fast or as slow as you’d like. In fact, we’ve had some students complete their program in less than a year, and others have chosen to take longer to complete their program, while balancing work, family, and school. What are assessments and projects and how do they work? Assessments—the tests, projects, and other activities used to measure your knowledge—are developed by UW faculty, who draw upon the latest standards in business and industry, to best capture the competencies that define UW degrees and certificates. Some assessments are based on tests and papers used in traditional classroom formats. Others require a portfolio assessment. Still others require observations of clinical demonstrations and other experiences. Once you pass an assessment, you will be able to directly and reliably demonstrate what you know to employers and others seeking your skills. Projects require students to apply their knowledge and skills to real-world business scenarios in a meaningful way. For example, if a project consists of creating a marketing plan for a new beverage, to successfully complete that project, students will have to demonstrate mastery in market research, design print and social media, budget development, and product presentation. As students advance through the business degree curriculum, projects are designed to progressively develop their skills from beginning stages to advanced levels of expertise. Are UW Flexible Option programs offered completely online? All of your academic coursework occurs online – you’ll never need to come to campus (unless you want to come walk in your graduation ceremony!). Some programs, though, include hands-on or clinical assessments and experiences that require interactions in a workplace or clinical setting. Contact an enrollment adviser with questions specific to your program of interest. Competencies are skills and abilities—the things you need to know and be able to do. In the UW Flexible Option, you complete your program by enrolling in ‘competency sets’ (a bundled set of competencies that together define the skills, abilities, and knowledge of a particular subject area) rather than traditional courses. When do semesters start and how long are they? In UW Flexible Option, the period of time that you complete coursework in is called a ‘subscription period’ instead of a semester. For all our credit-bearing programs, a subscription period is 3 months long. Subscription periods start the beginning of every month to allow you to get started on your degree whenever is most convenient to you. You are applying to a UW Flexible Option certificate (non-degree) program. Your application is valid for one calendar year after your date of submission. Applicants interested in continuing the application process after a year will need to submit a new application and pay a new application fee. If you need to cancel your application for any reason, please complete a brief Application Cancellation Request form. Official transcripts should be sent directly from each school attended. Official transcripts can either be mailed or sent electronically through a secure document sending service (such as Parchment, Credentials, or the National Student Clearinghouse). Transcripts sent by email as an attachment or by fax will not be accepted as official. Is my high school transcript required if I’ve completed college coursework? Your official high school transcript is required unless you have earned a Bachelor’s degree from an accredited institution. How do I change my desired start date? If you would like to change your desired Flex start date, please complete a brief Term Change Request form. Is there a student orientation for me to attend? We are committed to doing all we can to set the stage for student success and make sure students are well-prepared for a competency-based education program like UW Flexible Option. For that reason, all students must participate in an online orientation program. Orientation, Part 1 must be completed as part of the application process. A link to this self-paced, online orientation module will be emailed to you after you have submitted your application for admission. Then, upon admission, a link to a second required orientation module, Orientation, Part 2, will be sent. When can I apply? Is there a deadline? You can apply up to 5 months before any given subscription period, (which begin every month). Your application and required materials must be received one month in advance of your desired start date. You would like to begin your UW Flexible Option program in May 2018. You may apply for admission as early as January 1, 2018, but no later than April 1, 2018. All of your application materials must be received by the end of the day on April 1. We encourage you to apply early to ensure all documents are received by the deadline. UW placement tests are designed to determine your current English and math skills and to place you into the appropriate college-level English and math competency sets. You have previously attended college, but have not completed any transferrable college-level English and/or math courses. Once we have received your required application materials, you will be notified if a placement test is required. If you are required to take a placement test, you will be sent detailed information about the test as well as instructions for scheduling the test. It is important to schedule the placement test as soon as possible. As with other required application materials, we must receive placement test results no later than the first day of the month prior to your desired subscription start date (e.g. July 1st for an intended August start). Once the Admissions Office receives your scores, we will send you an email with your placement level and any additional actions needed to complete the admissions process. Do I need to send ACT or SAT scores? Results from the ACT or SAT are required for students under the age of 22 who have never attended college. Students aged 22 or older who completed either test are encouraged, but not required, to send in your scores as they may strengthen your application. How long until I know I’m admitted? Once the Admissions Office receives all of your required application materials (including placement test results, if required), they will email you an admission decision within 3 to 5 business days. Your Enrollment Adviser will guide you through the application process and inform you of what documents you will need to provide, such as transcripts from other schools. To get started on your application, please go to apply.wisconsin.edu, and choose the UW Flexible Option! Note: There is a separate registration process for the Substance Use Disorders Counselor Certificate program. Click here for details. The admissions staff will consider your academic history and readiness, your intended program, relevant work experience, and your potential for success when making an admissions decision. Please visit the admissions page for your intended program to learn more about the specific requirements, or contact an Enrollment Adviser at 608-262-2011 or flex@uwex.edu. Can I get credit for AP or CLEP exams? You may be able to earn credit for satisfactory completion of Advanced Placement (AP) or College-Level Examination Placement (CLEP). Determination of how your scores will transfer will occur upon admission. In order to learn more about credit-by-exam opportunities and how your exams might transfer, please visit our resource page on transferring non-coursework credit. Do you provide transcript evaluations? Transcript evaluations are performed after admission. Once the transcript evaluation is complete, your Academic Success Coach will help you develop a personalized Academic Plan of Study that outlines the remaining competency sets or projects that you will need to complete to earn your degree or certificate through the UW Flexible Option. Will the credits that I earn through the UW Flexible Option transfer to other colleges or universities? As with credits earned through traditional degree programs, the school receiving your credits will decide which credits will transfer and/or count toward degree requirements. In any situation where you would like to transfer credits from one university to another, it is important to check with the school to which you want to transfer first for guidance about degree requirements and transfer policies. The total number of credits required to earn your degree depends on your academic program’s requirements and any transfer credit earned from colleges you have previously attended. Please check out your program of interest to learn more about the required credits and transfer policies. Does work experience count for credit? Work experience does not count for credit, however, you might find that the knowledge gained through your work experiences is a foundation you can build off of to complete assessments. As soon as you pass an assessment or successfully complete a project, you can move on to the next competency and assessment required for your degree or certificate. Since our programs are self-paced, the foundation you have from you work experience can accelerate your progress in your program. Do credits earned from other colleges or universities count toward UW Flexible Option programs? Prior coursework is valued, and we will make every effort to award as much credit as possible. Your prior credits will be assessed for transfer upon admission, and is awarded if it is similar in level and content to coursework within your chosen UW Flexible Option program. Please note that some course credits may become outdated as technology, teaching methods, and research change. If it has been several years since you completed a course, you may be asked to refresh your knowledge of that subject area to prepare for future study. Are there any additional fees beyond tuition? There are no additional student segregated fees with the UW Flexible Option, though you may need to purchase textbooks or some additional learning resources depending on your chosen program. The number of credits you transfer in, and the number of competency sets you complete at a time, will affect your total program cost. Tuition is $2,250, which is an all-you-can-learn option covering an unlimited amount of competency sets that you can complete in a subscription period. Some of our programs also offer a slower-paced, Single Option, which is $900 for a maximum of one competency set in a subscription period. Check out the tuition page on your program of interest to learn more! *The BS in Business Administration and the Substance Use Disorders Counseling Certificate do not offer a Single Set option at this time.